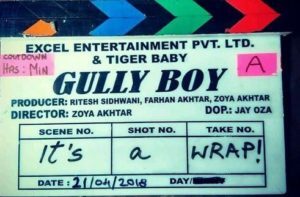 Ranveer Singh’s upcoming movie ‘Gully Boy’ shooting wrapped up. The movie is directed by Zoya Akhtar. It stars Ranveer Singh, Alia Bhatt in the lead roles. The movie is produced by Akhtar’s Tiger Baby and Excel Entertainment productions.